OF Cody Asche assigned to LHV for Major League rehab assignment. LHP Mario Hollands assigned to LHV for Major League rehab assignment. RHP Ben Lively promoted to LHV from Reading (AA). RHP Mark Appel placed on the DL (right shoulder strain). 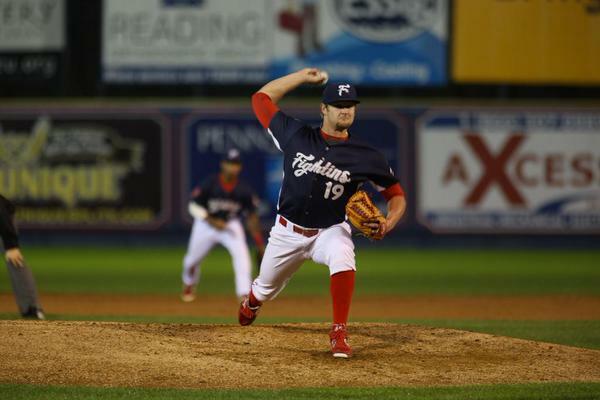 We touched on Mark Appel earlier in today’s “IronPigs Today” column. It’s not a good thing, and I’m hoping for the best because I really like the player and I really like the guy. I’m not sure Hollands ever played for the ‘Pigs, did he? I kinda remember him making the Phillies from AA a couple years ago. He looked decent in Reading the other night. 90-92 T93 if I recall. He was pounding the bottom of the zone and looked to have some decent movement on his pitches. Lively finally makes AAA after spending parts of this and the previous two seasons at AA, since coming over from the Reds organization (ironically, getting his first AAA start against their affiliate tonight) for OF Marlon Byrd. He’s really had 47 starts at AA, and it’s about time for the next test. Many were predicting his start this season to be in AAA; however, with the log-jam of starters and his uninspiring numbers last season, you could really see why they started him in AA–as they did with Asher. Lively has thrown better this season, too. He’s keeping the ball lower and controlling his fastball better, which is allowing his secondary pitches to play up. While his walks and strikeouts are similar this season, he’s doing much better at pitching to contact and getting quick outs. Asche hasn’t looked great so far in his rehab, but Monday night when I saw him in Reading, he was just missing on a few pitches. He should get his timing down as he works here, and hopefully we can be the beneficiary of some big games before he goes back up to the big leagues. He’s one guy who’s certainly done it at Coca Cola Park before!